In Arizona, a patient wishing not to be resuscitated in the event of heart failure can ask their physician to sign a Do Not Resuscitate (DNR) order which instructs Emergency Medical personnel to withhold or withdraw CPR. 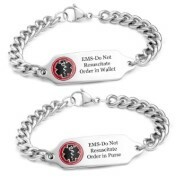 The Arizona Department of Health allows residents to wear a metal bracelet that signals to EMS that they have a Do Not Resuscitate order, and tells where it can be found (in their wallet or purse). StickyJ Medical ID provides Arizona Do Not Resuscitate bracelets that are engraved with either DNR Order in Purse or DNR Order in Wallet. (Note: you will need to carry a copy of your DNR order in your wallet or purse whenever you go out). There's also room to engrave your name, date of birth, and emergency contact information on the back, if desired. If you have any questions about the Arizona rule or the benefit of wearing the metal alert bracelet, please contact us at 727-823-9500. If you prefer to order by mail, you can download a DNR bracelet order form by clicking on Arizona Do Not Resuscitate Bracelet Mail Order Form. Or, you can place your order online by clicking on the bracelet photo below.